This page gives you all the resources you need to learn the rules for how to play quidditch. The rules of quidditch are fairly similar to the books, with some amendments. All players are mounted on a 'broom' at all times. A 'broom' is really just a stick around a meter in length, usually made of either PVC or wood. This acts as a handicap in the game. 3 chasers, 1 keeper, 2 beaters, and 1 seeker. Positions are differentiated by coloured headbands. Chasers and Keepers use the quaffle, a slightly deflated volleyball, to try and score through one of three hoops at the other end of the field, in something akin to a mix of rugby and basketball. Goals are worth 10 points. Beaters use bludgers (dodgeballs), to try and knock other players out of play. If hit by a bludger, a player is 'beat' and must drop any ball they are holding, and not participate in any kind of play until they have tapped back on at their own hoops. The game ends when the snitch, a third party person with a short tag attached to the back of their shorts, like OzTag, is caught. The seekers catch the snitch by grabbing this tag, which is worth 30 points. The snitch and seekers are only released after 18 minutes of gametime have elapsed, so that games have a chance to run their course for a while, before ending. Every goal scoring sport has a ridiculous handicap. In soccer you can't touch the ball with your hands. In basketball, you have to dribble the ball. In rugby, you can't pass forwards. In netball, you can't even move with the ball. In quidditch, you're allowed complete freedom of movement with the ball. You can run with it, hold onto it, kick it, pass it to anyone anywhere with no off side rule, in a completely free running game. This makes the broom a handicap - making everything slightly harder because you have to do all that while keeping a stick between your legs at all times. You don't have to be holding the broom, but if you're not, it obviously makes things a lot harder, and if it comes out from your legs, either accidentally or when you get 'beat', you are 'dismounted' and must return to hoops before being able to be involved in play again. This is one of the most interesting mechanics of the game. Few other sports feature a rule where players can temporarily and strategically be removed from play. And before you ask, no, there are surprisingly few injuries caused by the broom. Even for males. Quidditch is played on a field roughly twice as long as a basketball court, with the hoops inset from the edges. Players may play around the hoops, and goals can be scored from in front or from behind. At the start of the game, the starting six players from each team line up at the starting line in front of their hoops, with the quaffle and three bludgers lined up on the centre line. Gameplay begins when the Head Referee calls "Brooms Up" and the teams run into the middle to get the balls. Quidditch uses rolling subs - at any point, a player may sub off for another player of their position from their sub box. A team has unlimited substitutions in a game, and players may come and off however many times they please. Quidditch is a full contact sport. There are many forms of contacting another player, and a full summary can be found in the abridged rules on the right panel. In general, wrapping and tackling (bringing someone to the ground) is only allowed on people who are holding a ball, and must be from the front, and with one arm, above the knees and below the neck. You are only permitted to tackle someone who uses the same ball as you (beaters may tackle beaters, chasers and keepers may tackle each other). Seekers cannot tackle each other, but can engage in off-ball contact, like all other players, which can include grappling, stiff arming, pushing, grabbing, etc. Seekers cannot impede the motion of the snitch. The snitch can do pretty much anything to the seekers. Quidditch is a complicated game with a lot going on, and therefore, it has a lot of referees - 1 Head Ref who watches the quaffle play, 2-4 Assistant Referees who watch the beater play, a Snitch Ref, two Goal Referees, and then a Scorekeeper and Timekeeper. Players who commit fouls may be made to dismount and go back to hoops, or receive a blue, yellow, or red card, depending on the severity of the rule infraction. Quidditch is a mixed gender sport, mandatorily open to anyone of any gender, be that cis, trans, or non binary, or anything else. The gender rule says that there can only be a maximum of four people of the same gender on field for a given team at any point in the game. Quidditch is founded on the value of inclusivity and the notion that anyone can play quidditch regardless of their gender or anything else, as long as they can hold their own on pitch. Read more here. Below, you can find a more detailed overview of the rules for all the main positions of quidditch. The three chasers wear a white headband and use the quaffle (a slightly deflated volleyball) to score points by propelling it through one of three hoops. All hoops are worth 10 points and you can score from the front or from the back of the hoop. Chasers are not limited in their movement or ball carrying in any way (other than the broomstick, of course). I.e. they are free to run with the ball, pass it in any direction, etc. There are no off-sides. Chasers may attempt to get the ball of opposition players by stripping the ball off them, or tackling them, and may use their quaffle to try and deflect bludgers coming at them. 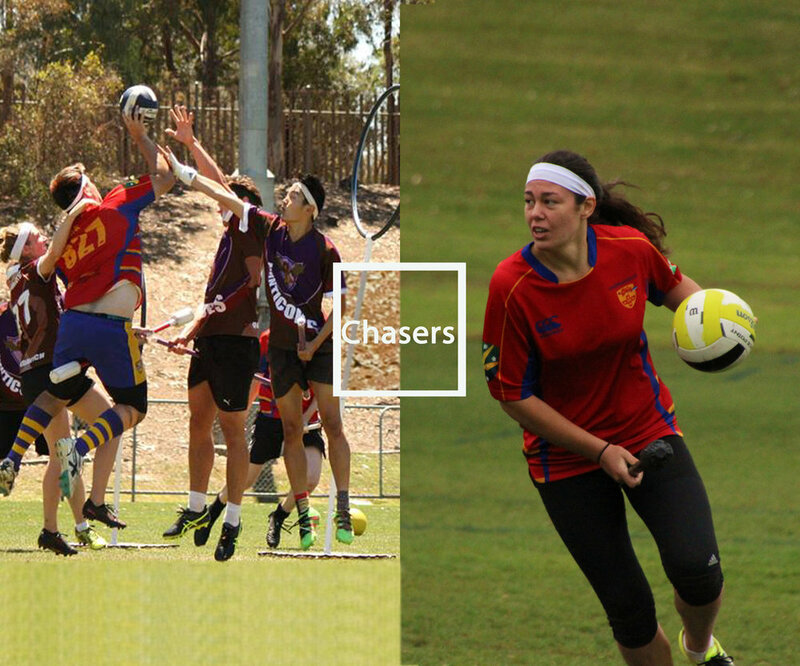 There are a huge variety of different people who play chaser - from the big and muscly who may try to power through the opposition, to the fast and agile who run circles around everyone, or the sneaky ones who come out of no where to take the pass and score. Keepers wear green headbands, and are essentially glorified chasers, who have special powers in their own Keeper Zone around their hoops. There is only one keeper, and when they are in their zone, they cannot be knocked out by a bludger, and once they have the ball, they cannot be tackled or have the balltaken off them (in their zone). Otherwise, the keeper functions pretty much exactly the same as the chasers, though often they play a slightly different role, guarding the hoops while on defence by blocking shots and tackling players who are trying to score, and organising the other players in front of them, and then playing a similar role to quarter back/play maker on offence. The keeper by no means has to stay by their own hoops, and it is entirely common for them to go up on offence with the other chasers. Beaters wear black headbands, and use bludgers (dodgeballs) to knock out other players. If a player is hit by a thrown (or kicked) bludger, they are dismounted, they must stop interacting with the game immediately, must drop any balls they have, and return to their hoops to tap back into play. Beaters are used on offence, to get defending players out of the way of their attacking chasers, or on defence, to stop players who are trying to score, and forcing a turn over. Beaters can beat any other player - chasers, keepers, or seekers, and they can also attempt to get bludgers off the opposition beaters by tackling them. They can also use their bludger to deflect incoming bludgers from enemy beaters and are safe if they catch a thrown bludger. There are two beaters per team but only three bludgers. Since you can only hold one ball at a time, this leads to a constant imbalance in which team has two bludgers ("Bludger control") and which team only has one. Having both bludgers confers a major advantage, and the beaters add a huge degree of tactical depth into the game. Bludgers are also the great equaliser of quidditch. It doesn't matter how big the chaser is who's charging down the field trying to score - a tiny person with a bludger will stop them in their tracks. The snitch is a person! Well no, not exactly, the snitch is a tennis ball in a sock/piece of fabric that's attached via velcro to the back of a person's ("the snitch runner") shorts. You may think that the snitch runner is therefore just someone who is extremely fast and agile and evades the seekers for as long as possible. More common in fact are snitches who are simply big and strong enough to just stand their ground and throw away (quite literally) any seekers who come at them. It is kind of also in the culture of snitches to be as arrogant and show-y as possible. The game only ends when the snitch gets caught. To aid in this process, the snitch is successively handicapped (e.g. Can only use one arm or has to stay in a confined part of the pitch) over time. Snitches take their role very seriously and take a great deal of pride in what level of handicap they reach before they're caught, and are a kind of ref in the game, in that the are a third party. Sydney University's official Quidditch Club! If you're looking to try a new sport, challenge yourself, get active in a fun and inclusive environment, and make some friends along the way, this is the place for you. 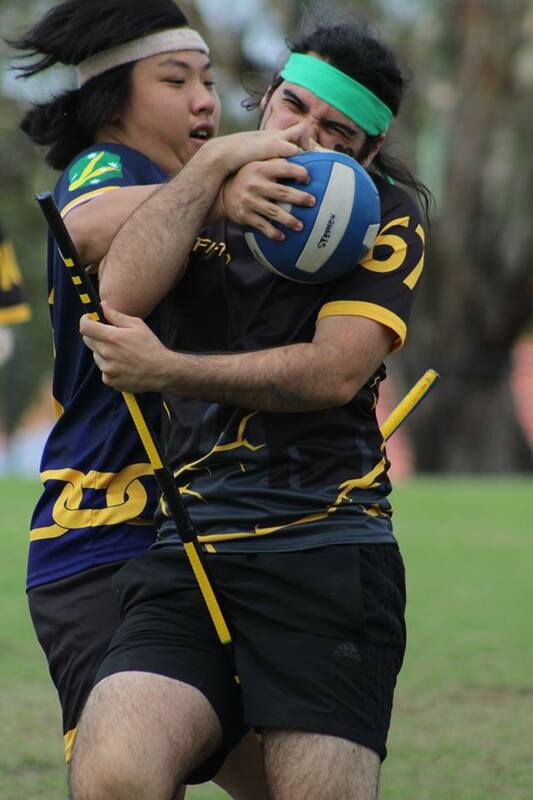 We field three teams in the competitive NSW Quidditch League as well as running our own more fun and development based internal USyd League. Our A team, the Unspeakables, has been one of the top three teams in the state for the past three years (2016 Champions), and top 5 at Nationals. We train usually three times per week in Victoria Park, as well as running loads of team bonding events, socials, Harry Potter related events, and more. We even run quidditch events for kids ("Kidditch") and corporate team building. If you'd like to learn how to play quidditch, we'd love to teach you, and there's always a spot on one of our teams. Quidditch is fast paced, full contact, completely gender integrated, and we are open to all. #ComeFlyWithUS. 2018-2020 IQA Quidditch Rulebook - The Full (and extremely long and detailed) version of the rules of the sport, produced by the IQA. Quidditch Abridged: For Players - Detailed but condensed rulebook designed for (new) players, produced by our ex-president Natalie Astalosh. How to play Quidditch: A short video explaining the basics of the rules produced by our friends at Bristol Quidditch Club.